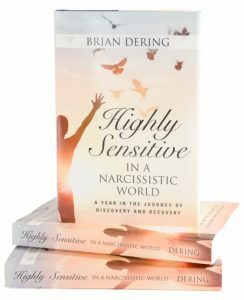 In this book, Brian shares what he has learned during the past half century regarding Narcissists and being “Highly Sensitive”. This book is motivational, inspirational, informational, and educational and is intended to help others recognize and recover from Narcissistic abuse. The refreshing “Thought of the Day” format allows the reader to sit back and ponder the individual “Thoughts” as they may apply to themselves or other people in their lives, at their own pace. The intention of this book is to let others who have experienced, or are experiencing, narcissistic abuse know they are not alone. There are patterns and signs we can become aware of that may help us to recognize and avoid many toxic people in the future. Click HERE to go directly to the publishers site to purchase your copy now!